But honeybees are not the only insects that do this crucial job. The various species of wild bees, too, are busy pollen collectors and pollinate a number of crops in the process. However, their importance has long been underestimated. But we now know that the yields of many crops increase noticeably when not only honeybees but also their "wild" relatives are abundant in fields. "So we studied how the number of bees on agricultural land can be increased with sustainable effect," Ingolf Steffan-Dewenter explains. For this purpose, the qualified beekeeper and Professor of Animal Ecology and Tropical Biology at the Julius-Maximilians-Universität (JMU) Würzburg in Bavaria, Germany, together with his team and colleagues from the University of Wageningen investigated several landscapes with rapeseed fields. The study was conducted within the scope of the EU project STEP (Status and Trends of European Pollinators). The examined areas were located around Würzburg and in the Netherlands. First, the biologists installed so-called nesting aids at the edges of the fields – these are short bundles of reed in which the insects can lay their eggs. Over the next two years, they studied how many brood cells were produced in these nests and from which species. During the rapeseed flower in May, the fields attract vast numbers of pollinators. 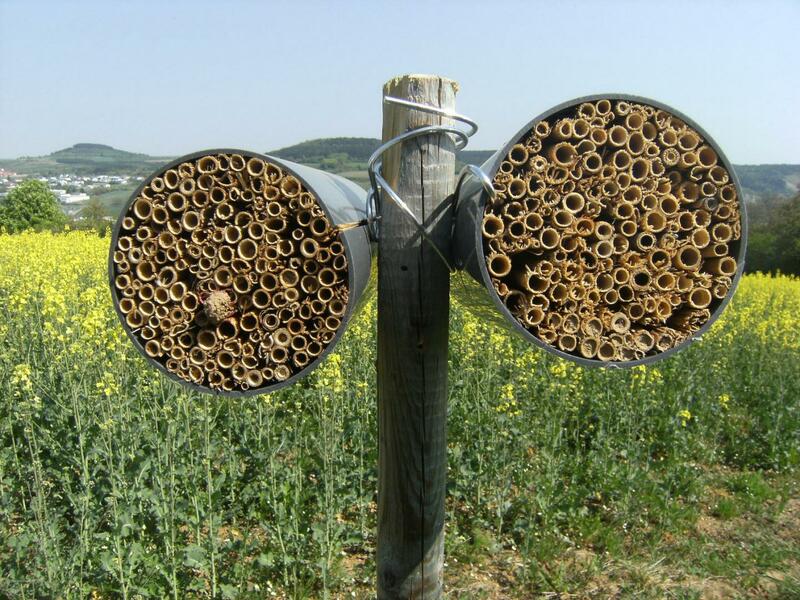 So it's no wonder that the number of nesting aids occupied by wild bees virtually explodes during this time. Afterwards, the nesting activity decreased significantly in both years. "Flowering plants are the only food resource of wild bees – and that both for the adult animals and their larvae," Ingolf Steffan-Dewenter explains. "The insects can only thrive in the presence of sufficient flowering plants." Rapeseed flowers for a few weeks only; afterwards the food on offer declines rapidly. Only wild bees whose activity patterns are during spring are capable of coping with these circumstances. "In order to settle a greater variety of bees, we have to create sufficient flower-rich areas near the nesting sites – small strips of wild flowers are often sufficient for this purpose," Steffan-Dewenter points out. "We were able to show that such measures but also nature-oriented habitats in the surrounding area have a positive impact on the abundance of wild bees in the fields." The availability of sufficient food resources is important, but the provision of nesting aids is also essential as was the case in the study. When enough nesting sites and flowering plants are available, wild bees can reproduce rapidly. "Our work has shown that comparably simple measures have a positive impact on the number and diversity of pollinators," the JMU biologist explains. This also helps farmers become more independent of honeybees, especially since wild bees can help boost the yield of many crops. Dr Andrea Holzschuh, co-author and research assistant at the JMU department, mentions other reasons why it makes sense to rely on different species of pollinators: A single bee species is at a much greater risk of being decimated by parasites or diseases; with more species the risk is lower. However, wild bees also have natural enemies and are vulnerable to pathogens: The scientists showed in their study that one in six brood cells was attacked by parasites and about as many larvae died as a result of infection. The greater the number of bees, the greater the percentage that fell victim to these problems. However, this effect did not impair the reproduction of the useful insects in the long run.